First distribution by Rip Off/Eigelstein Schallplattenvertrieb/Das Büro (as printed on back cover). Later distributed by EFA (those copies with EFA-distribution code-sticker on rear). Issued with a printed inner sleeve listing the lyrics and introducing previous Ata Tak-releases. 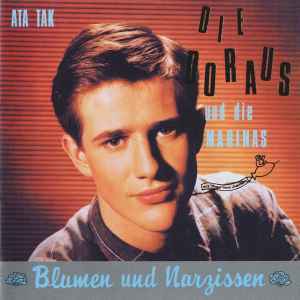 Queer to think Andreas Dorau was only 15 when he recorded this NDW classic. Together with Carmen (check her adorable ”Schlaraffenland,” available on the compilation Teutonik Disaster), they share with contemporary Transatlantic and Mitteleuropean new wave groups this almost childlike openness, so rare in today’s popular culture. (You’d find it in Nirvana, but not in Animal Collective, for example.) I wouldn’t call it naïveté; it's quite deliberate and definitely has a degree of mannerism, make-believe and performance to it, but it’s a certain _style_ of mannerism that fondly embraces the narrator's childhood past, much like contemporaries like, say, Madness, Kid Creole, Thomas Leer, or… ahem,… Falco. Allow me to be pretentious, but there are deep links also to the acts of remembrance found in so much European culture in the early 20th century (the sheer silliness of Dadaism, the sombre longing of Benjamin and Proust, the childhood paraphernalia collected by artists like Rauschenberg and Beuys). For a whole postwar generation of Germans this childhood remembrance was of course Verboten, for obvious reasons, but the Ata Tak bunch were of a later generation untainted by the war (quite like Kraftwerk, whose retro aesthetic could nevertheless be argued to be somewhat more controversial). I love every tune on this album! It’s so damn juicy. Most of all, I consider it an excellent statement of integrity, of being true to oneself, being original, not caring so much what other people would think. It's all about caring more about great melodies than about ”cool” (i.e. cautious) moves and reference points. Screw that. This is the best oddball pop there is. This is to youth, to joie de vivre. Prost! I discovered this group through "Lokomotivfuhrer" which was on an old German NDW compilation. That song is here thanfully in a longer version and this is a very underrated album. It is one of my fave new wave albums. It has punk energy but still uses a lot of cheesy old drum machines and silly cosmic synths. Infectious and listenable multiple times over people who like Sparks, Telex, Lio and people like that will like this a lot.